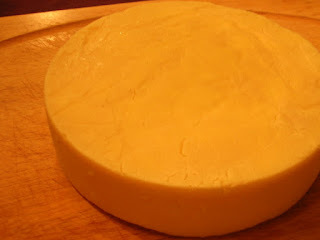 To open 2010, I'm trying two new styles of cheese, both of which are personal favorites of mine. The first is trying to replicate Epoisses de Bourgogne, a beautiful washed rind cheese from Burgundy. Washed rind cheeses get a lot of their defining characteristics from the liquid they're washed in. Taleggio is washed in saltwater, Affidelice is washed in Chablis, and Tornegus is washed in a blend of wine and herbs. The Chimay and Orval monasteries both make Port Salut-esque cheeses, washes in their trappist beers. Rochefort doesn't (at least not commercially), but they have licensed their name to another cheese-maker, who makes an odd cheese with shredded seaweed in it. The cheese's marketing seems to focus on the fact that you get your RDA% of iodine from the addition of the seaweed. Anyway, Epoisses is washed in a specific brandy called Marc de Bourgogne. Sure, try to find it in Pennsylvania. So I'm settling for regular brandy. For the first two weeks, the cheese is washed in a saltwater brine, then with brandy diluted with a bit of water. Washing the cheese smears/spreads the microorganisms that produce the reddish rind, characteristic smell, and bold flavor of these cheeses. This cheese is about 16 days old, just ready to begin washing with brandy. It's still very white, with only the faintest orange-hue at the corners. Secondly I'm making an Appenzeller-style Swiss. Appenzeller is a slightly zestier version of regular Swiss, with a bit more compact texture than a big-eyed Emmental Swiss. This was the first time I used my large cheese mold (3-5 lb capacity!) and it made a beautifully smooth wheel. Now the Swiss will sit at room temperature for three weeks so the Proprionic Shermanii bacteria can eat the lactose and produce those lovely cheese holes. Then it's into the cheese cooler to age for a few more months. 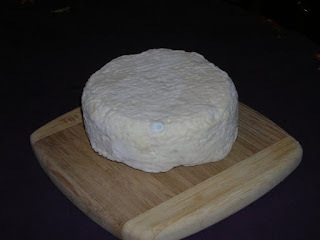 - If I added the culture to a blue cheese, would the resulting gas bubbles rip through the soft cheese? -If I added it to a dense cheese, such as a cheddar, would the gas bubbled crack the surface of the cheese? -I've never seen a goat or sheep's milk Swiss. This is probably because of the lower lactose levels, but would that mean the culture wouldn't have enough lactic nutrients to produce the eye-forming gas? What if I blended cow and goat's milk 50/50? Clearly I need to return to the kitchen.